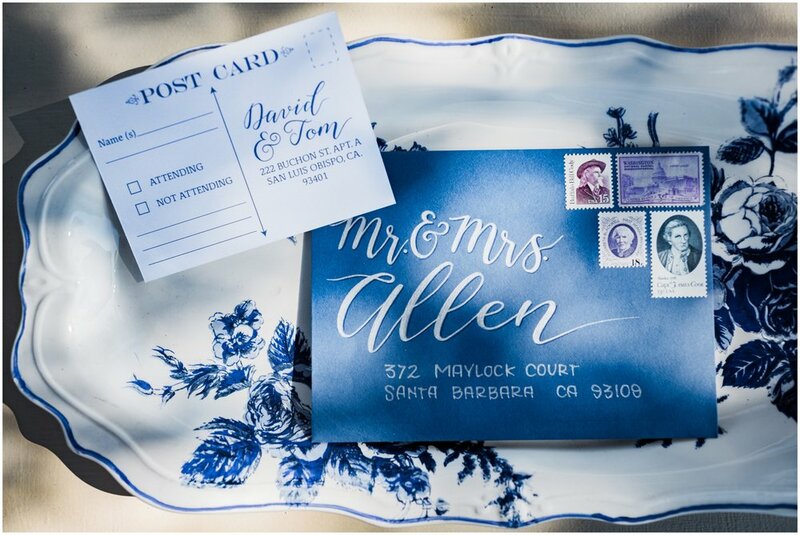 I am a sucker for destination weddings! Call me biased, but I really believe we have it all in San Luis Obispo! If you want a beach wedding- we have you covered! If you want a romantic vineyard wedding, we can do that too! Love the feeling of a wide open space with views for miles? We have that in the bag as well. 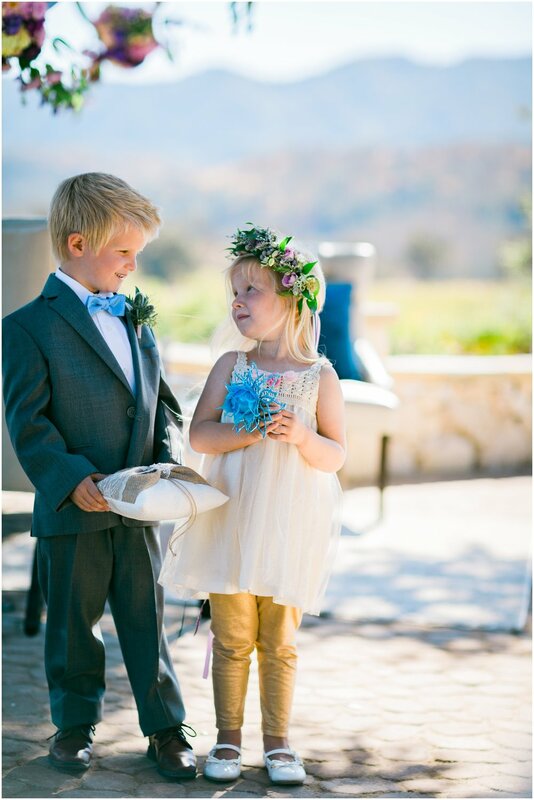 Really, if you want options and atmosphere, a San Luis Obispo County wedding is for you! To help convince you, I’m giving you my top reasons to host your destination here! No, really, it is (see Happiest Place! You can also ask Oprah, she’s a big fan! If you want to be somewhere that isn’t just beautiful, but full of cheerful, hospitable personalities, we’re it! If you haven’t been here, you’re just going to have to trust me. Come for a visit, you won’t regret it! If you’re familiar with the area, I’m pretty confident you can vouch for the joyful environment SLO offers! 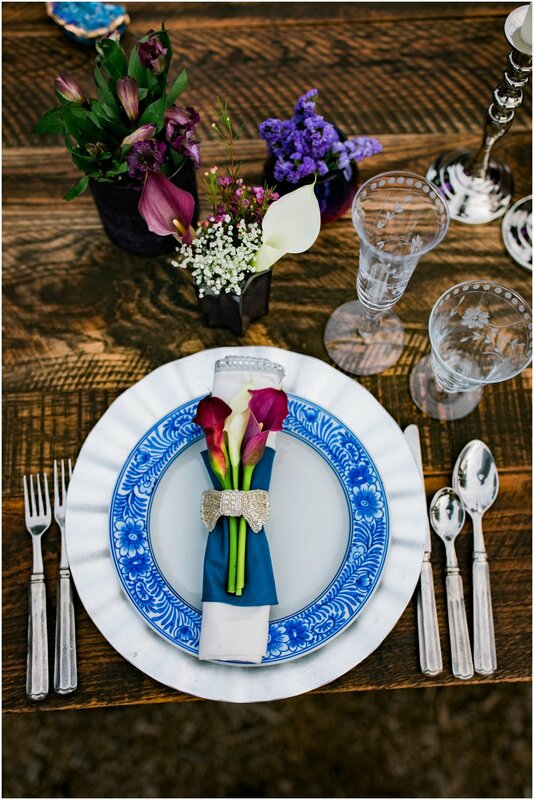 We can offer you a true wine country wedding without the Napa Valley price tag. Can I get all the praise hands for this one? Not to knock Napa, it is wonderful in it’s own way, but we’re just as awesome and way less expensive! We can still offer you refined yet (SLO)slow, easy living. We just won’t charge you an entire arm and leg for it. Ha! We’re within driving distance for all of your California guests! We can all appreciate a centrally located venue. SLO is perfect if you have guests that live on both sides of California- we’re smack dab in the middle of Southern and NorCal, so it’s easy to access for both sides of the map! For your California guests, San Luis Obispo has a great airport. For those traveling from outside California, we’re also just a short drive from Santa Barbara, Bakersfield, Monterey & Fresno airports! 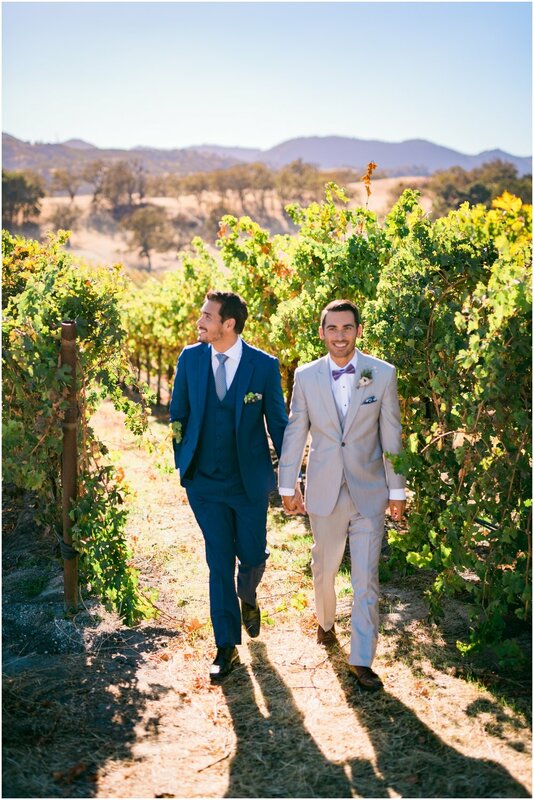 As I mentioned earlier, if you want a Vineyard wedding, we have you covered. If you want a seaside affair, we’re your place! We truly have options for every style and taste. Although ranch weddings are what I tend to share the most, I adore waterside weddings as well as an ultra glamorous, elegant hotel weddings. We offer a true Destination experience. We have TONS to do around here. So be it action-packed (I know the BEST zip line course) or lazy & relaxed, a wedding weekend is in your grasp. I’m happy to arrange a fine dining + wine tasting extravaganza or a spa-weekend for your ladies. Whatever you have in mind, I can help you arrange to celebrate for multiple days! I’d love to sit down with you over a glass of wine (in person or video chat) to talk about your wedding day and how I can help you make it everything you envisioned and more! 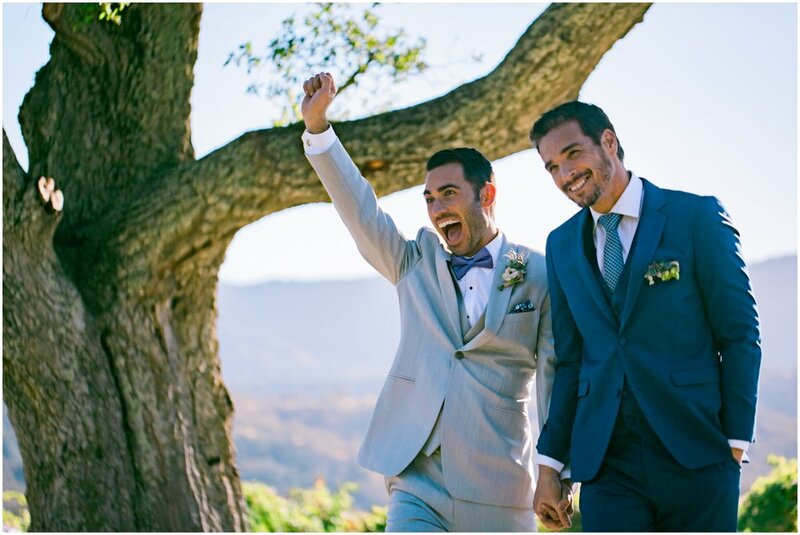 One of the first things I ask each of my couples is how they want their wedding day to FEEL. Do you want a multi-day celebration that feels like a retreat? Do you want them to be whisked away to a foreign country, without the hassle of actually going to a foreign country? Do they want something that is laid back yet elegant, brimming with warmth and refinement? HOW you want to feel on your wedding day is more important to me for planning than almost anything else. My job is not just to execute your day flawlessly, but to make the experience magical. 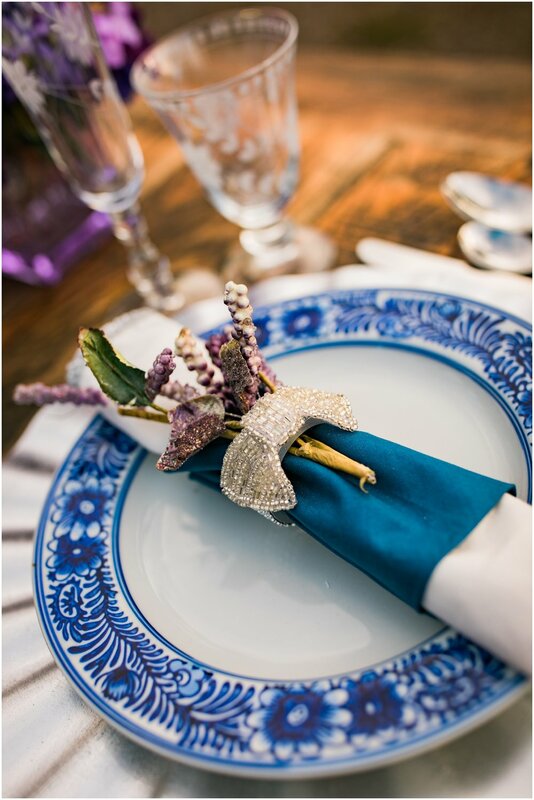 Knowing the things that are important to you as a couple and to your wedding day will help me source only the best for your individual style and taste! With that said, I also know my couples sometimes need a little inspiration. So, I thought it might be a good time to discuss some of the amazing wedding venues we have here in San Luis Obispo. First up, I want to talk BARN style weddings! Now, a California barn isn’t like any other in the country. 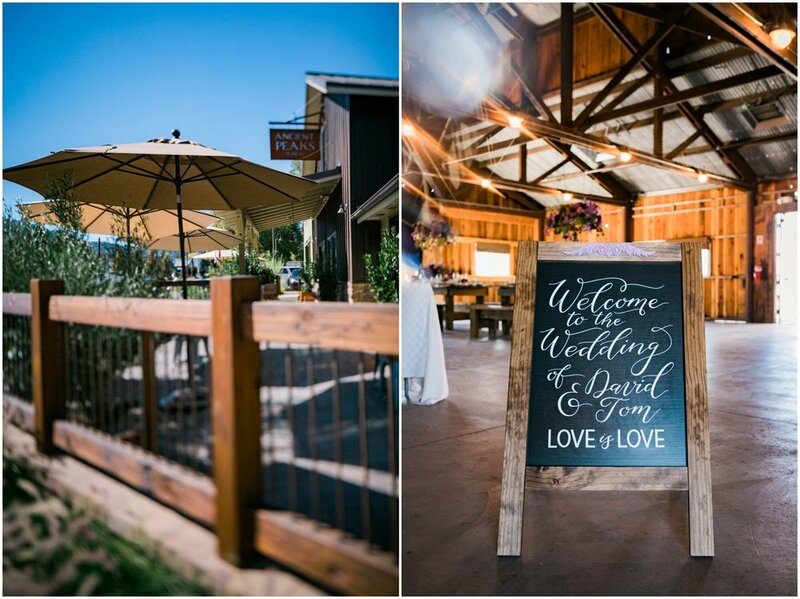 Here is San Luis Obispo, we often use the term ranch to refer to a wedding venue that has a barn-style venue. Many of our “barn” or “ranch” style venues are also referred to as vineyards because they have a winery component. I know that can seem a little confusing, so I thought it might be helpful for me to break down some of our more popular “ranch” venues in the SLO area so that you can feel better prepared for what you may see. Hint- they all have sweeping landscapes with LOTS of space & views for days! Seriously, we have so many gorgeous venues in San Luis Obispo. 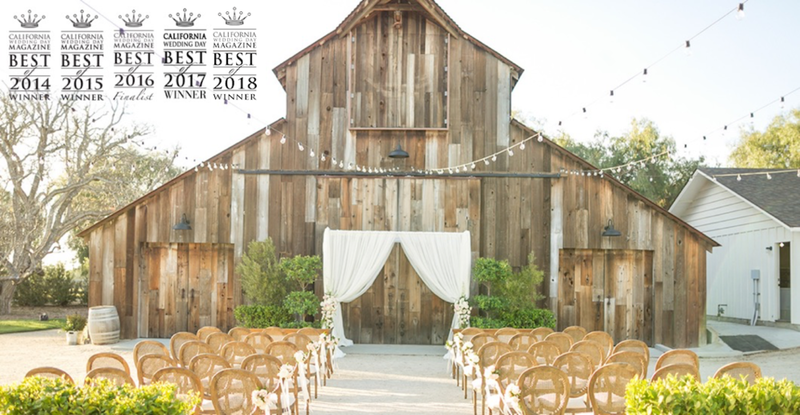 I’m going to give you a quick recap of five of my favorites (stay tuned- I have an entire series of posts about wedding venues in Paso Robles & the surrounding area). Quick disclaimer- some of these descriptions are a bit on the formal side. Consider this a cliff-notes style roundup that will tell you the nitty-gritty details. You really have to see these venues to appreciate them (and I’m more than happy to help you with that)! I love this venue SO much! The Vintage Ranch is a 40-acre vineyard located three miles from town, nestled amongst beautiful rolling hills and surrounded by vineyards. The main house on this unique property is a completely remodeled 90-year-old farmhouse and the guest house (called the Cottage) is equipped with thoroughly modern conveniences and all the charm of the past. The Vintage Ranch is a fabulous choice forrustic elegance in a secluded environment. The Santa Margarita Ranch is the only location that I would say fits the bill in a traditional sense. They have five unique locations on the property to explore, but only two that are used for weddings. They have a gorgeous barn and a stunning grassy lawn to host both ceremony and reception. If you want minimal, sophisticated, elaborate, enchanting, magical, elegant, romantic or anything in between AND a location that was seen on The Bachelor (YES!) , the Santa Margarita Ranch has the perfect match for you. Peppertree Ranch boasts Sweeping views of the Santa Lucia Mountains. A fun history lesson for you: This area of the Central Coast has been in constant agricultural production ever since 1834, beginning with large cattle and dairy operations, and, more recently, extensive viticulture and wine operations. 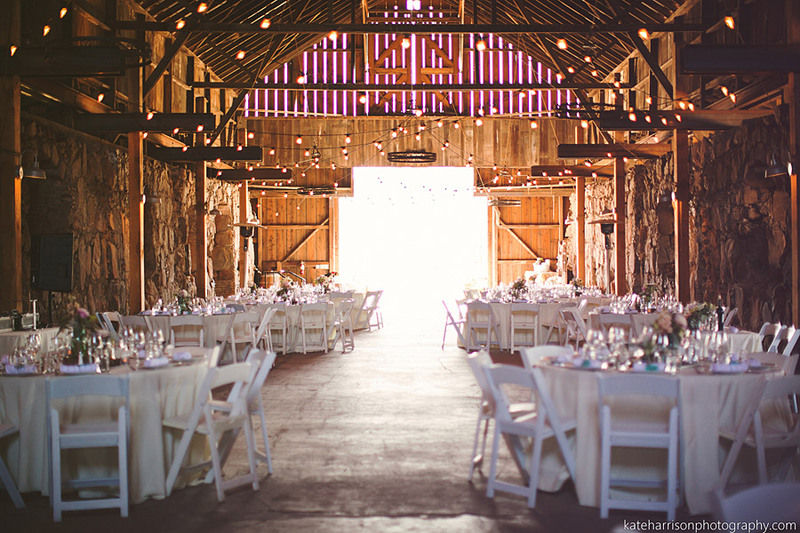 The Rustic Barn- our historic barn is the perfect setting to dine and dance the night away. Or opt to use one of our covered outdoor spaces for your reception, and have your ceremony in this romantic, rustic structure. The Terrace Lawn- the expansive terrace lawn makes a lush and beautiful backdrop to your wedding ceremony and can accommodate dining for up to 500 guests. The Verandah- this covered outdoor space opens up to magnificent vistas of the Santa Lucia Mountains and surrounding valleys and is the perfect space for a ceremony, cocktail hour, or rehearsal dinner - your imagination is the limit! The Pond- this picture-perfect ceremony site is sure to delight you and your guests and is the perfect spot for romantic photos after your ceremony. This location is such a gem and we love that it boasts both historic qualities and modern updates! The Ranch House is a sprawling 6,000 square foot home sitting on the highest part of the ranch with 360 degree views including the vineyards and the Seven Sisters mountain range. The two original homes on Greengate Ranch have been completely taken down to the bare bones and renovated with the modern amenities and design, to become beautiful vacation rentals. The Carriage House is a three bedroom, two bath home with great room. In August of 2016, a third home was built. The Vineyard Cottage is a spacious and serene three bedroom, three bathroom that overlooks the rolling vineyards below. Both barns have been restored from top to bottom, while maintaining their historic design, wood facing, and charm. It is close enough to the vintage barn that you can combine the spaces. Accommodates up to 600. Capacity: Up to 1,000! However, they have space for intimate weddings of up 50 as well! Amenities: Permanent guest restrooms, catering kitchen, tables, firepits and more are also already on site and available for your use in addition to the permanent installation of bistro lighting in our Vintage Barn Courtyard. 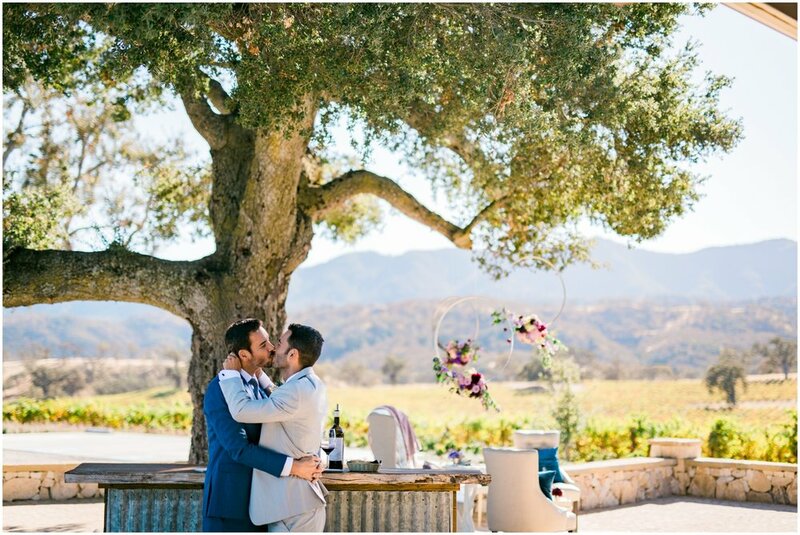 HammerSky is a breathtaking choice for a barn AND winery wedding venue! It is located in the westside region of Paso Robles, California. This picturesque property is a perfect setting offers an inviting environment that is wonderful for weekend long celebrations. 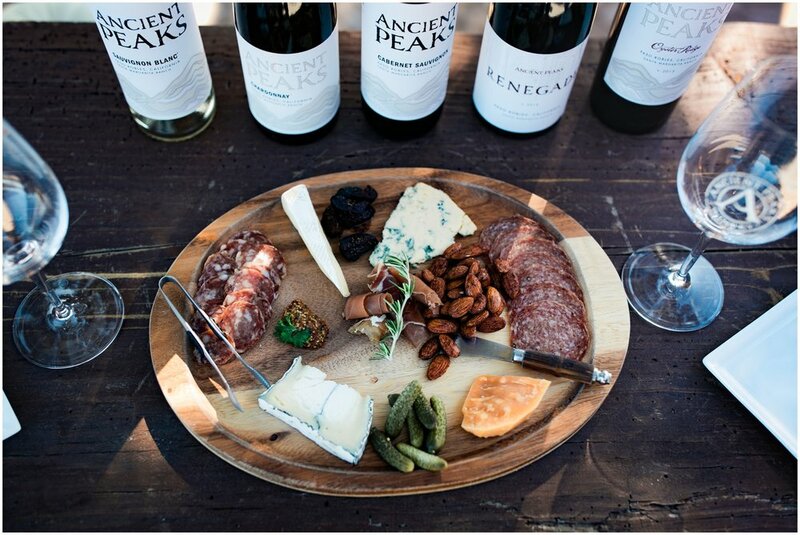 The tasting room serves their estate grown, award-winning wines and has an amazing view of the rolling vineyards and meadows. *Hint* We love this area for rehearsal dinners! The billowing canopy of a 400 year old oak tree and move your reception into the rustic and romantic barn for an all night party! 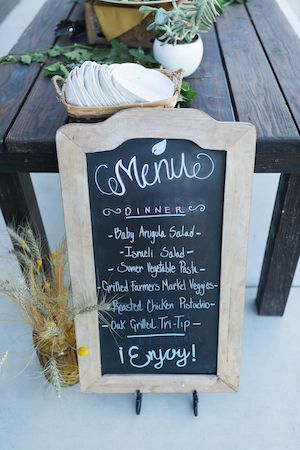 They offer four ceremony/reception sites: Oak Tree Lawn, Vineyard Vista, Farm House, and Barn. Amenities: On site bar service (do you need anything else- HAHA)! Whew! I’ve given you a lot to think about, huh? 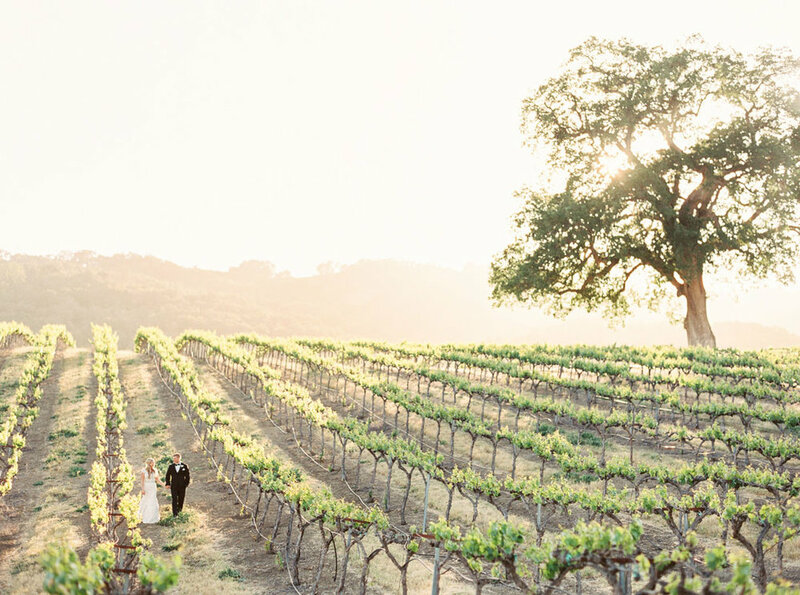 You really can’t go wrong with any of these gorgeous wedding venues in San Luis Obispo. I can’t wait to hear which one you love most! David and Tom’s wedding weekend was action packed- it included wine tastings, brunching and zip-lining. It was SO freaking amazing, I can’t even put it into words. I love these two so much and the vendor team was seriously fabulous. The weekend-long festivities concluded with their ceremony and reception at Oyster Ridge barn. It was a stunning afternoon! 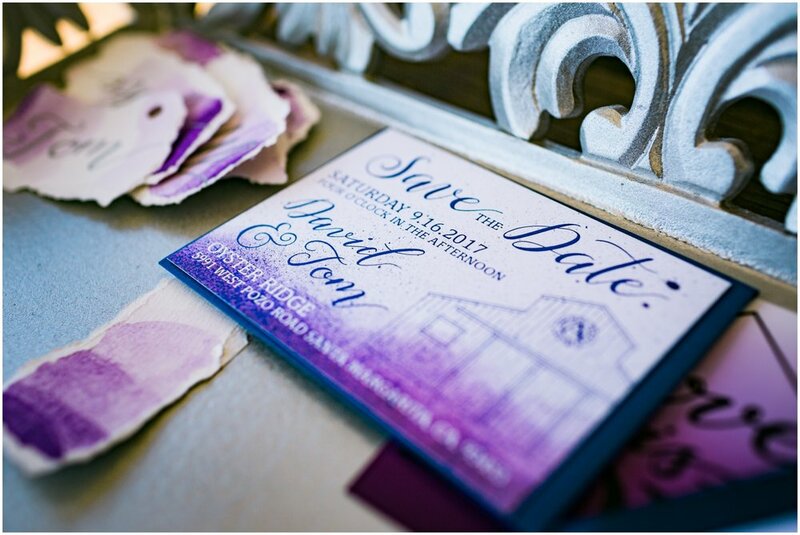 We are totally obsessed with the color palette - purples, blues and pinks and ombre are our personal favorites, so bringing a design together that incorporated them all made me so happy. Seriously SO romantic! We added a bit of chalk art to symbolize that Love Is Love! 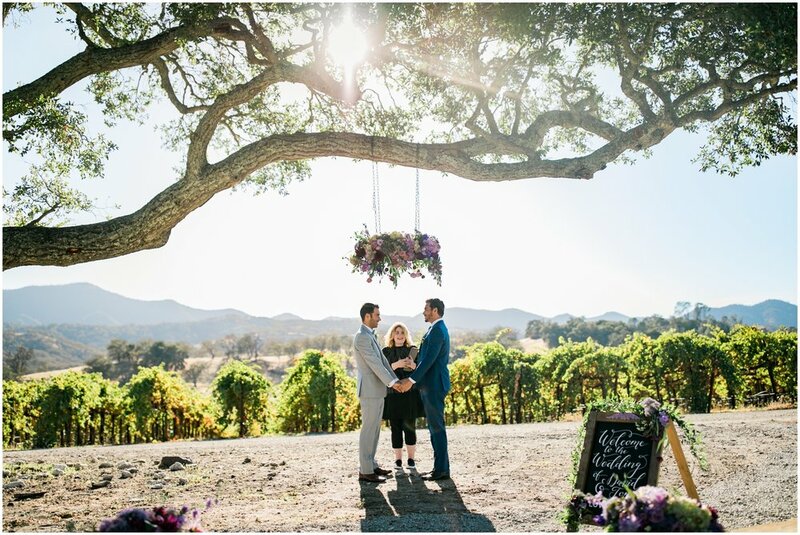 A circular rainbow surrounded the couple during their vows. 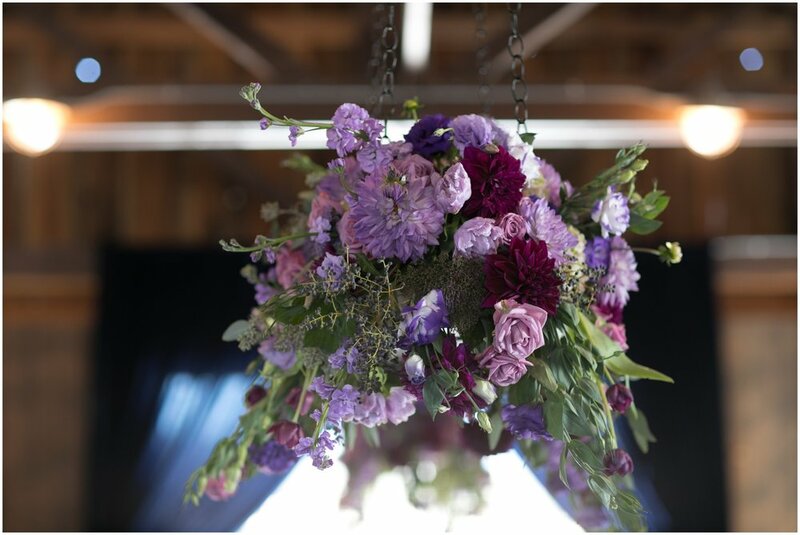 A floral chandelier was the perfect halo for the ceremony. The reception‘s cocktail hour on the patio was equal parts cozy and elegant. The design included a comfortable setee that was perfect for cuddling & coversation with suspended, circular floral arrangements floating above. I could have lived there! 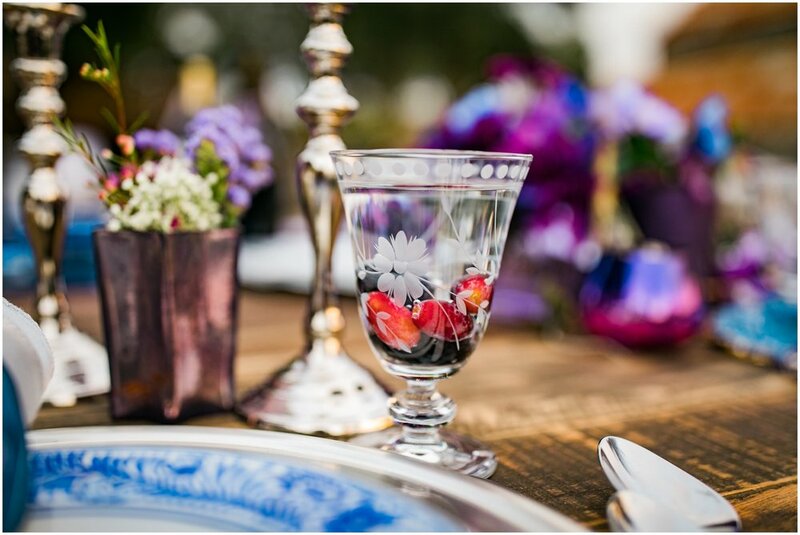 Inside, farm tables were garnished with the prettiest mix of vintage plates, glassware and flatware in vibrant hues and fun pattens. And of course, more suspended arrangements. We also incorporated geodes into the design (via the table numbers) . 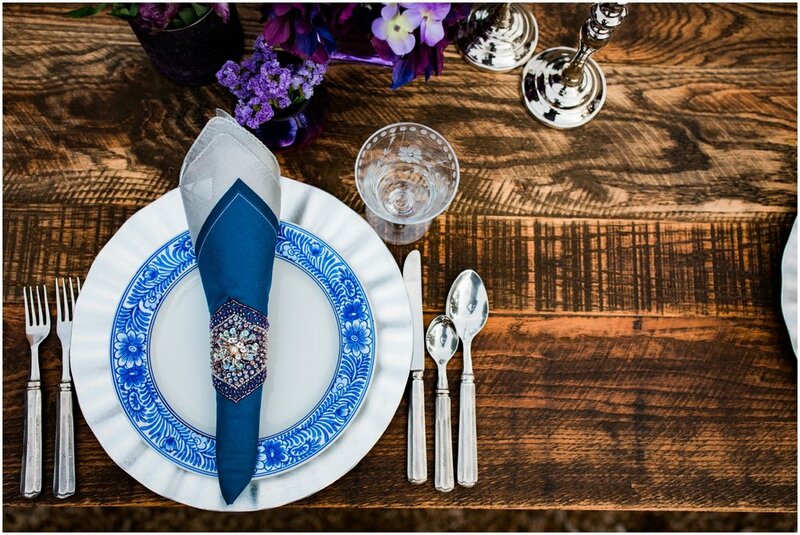 We can’t forget to mention some of our other favorite design & decor elements from the day! 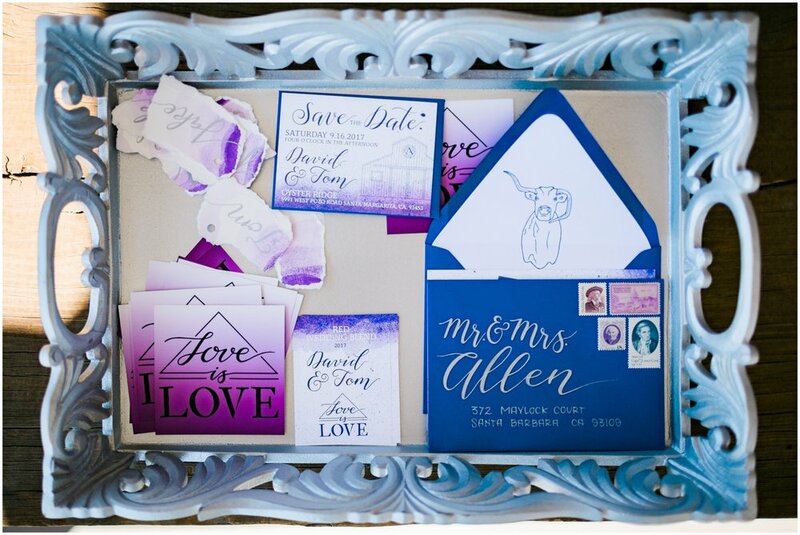 The gorgeous invitation suite, custom wine labels, favor box and signage gave us all the feel goods! We kinda live for the details, so we spent a lot of time ensuring everything was cohesive and personalized. It was totally worth the work! 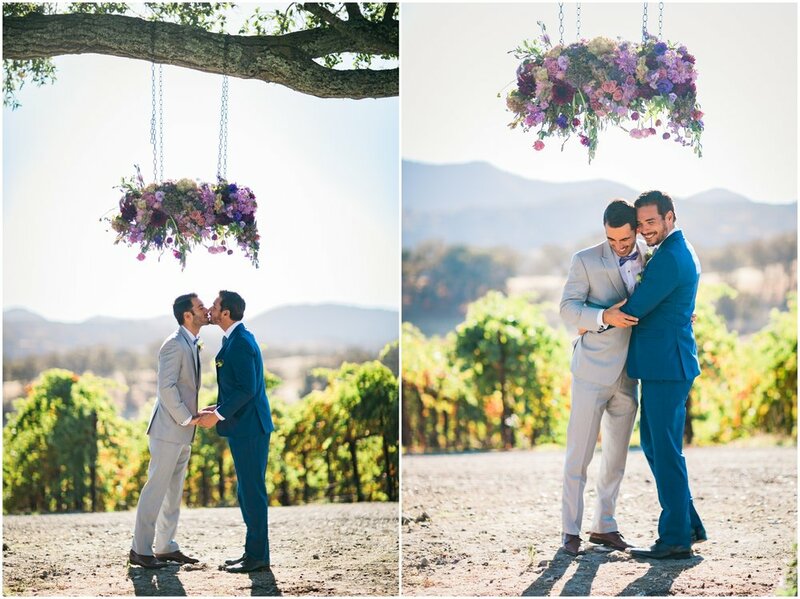 We hope you love the photos of this day as much as we do! Be sure to check out this stunning event on Love Inc Mag too! Sometimes you feel like you become part of the family while planning a couple’s wedding, but these girls definitely became part of our Central Coast House of Design family. My favorite planning moments were watching these two interact: they both just wanted to make each other happy. 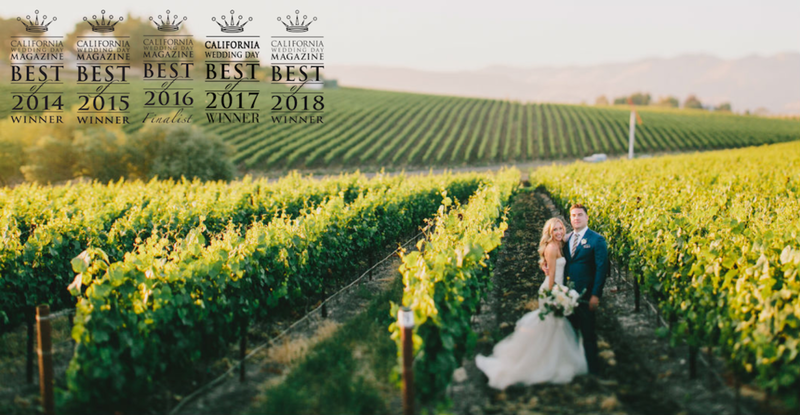 The brides live in Los Angeles but selected Oyster Ridge Barn at the Ancient Peaks Winery for their wedding weekend; halfway between Los Angeles and San Francisco. A family member who works in the wine industry introduced the whole family to their wine and it quickly became a favorite place for tastings. 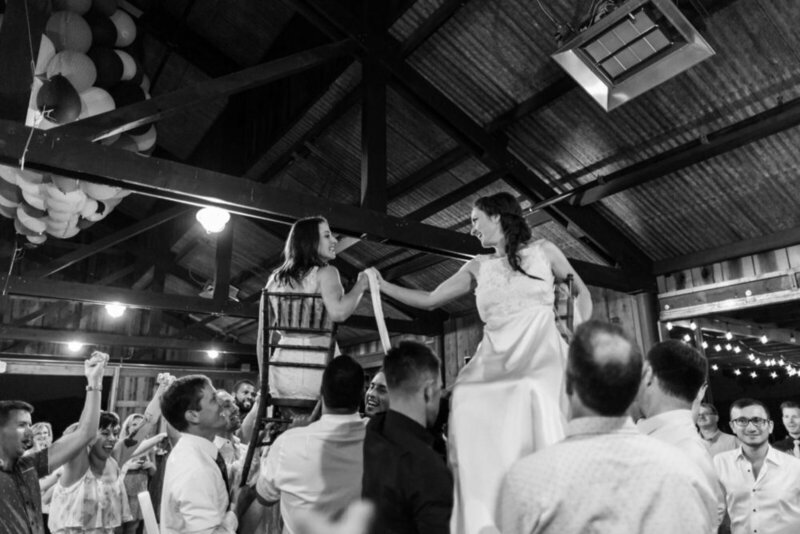 When they built Oyster Ridge Barn, the girls were one of the first to book the space. The brides wanted a wedding weekend for everyone traveling in that showcased everything local. 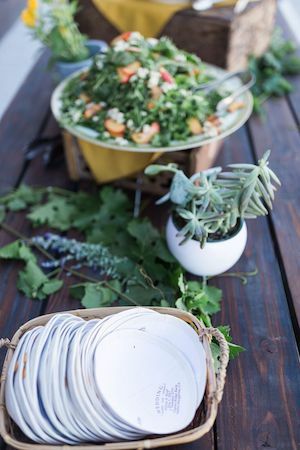 The wedding vibe was bohemian, minimalistic and natural. 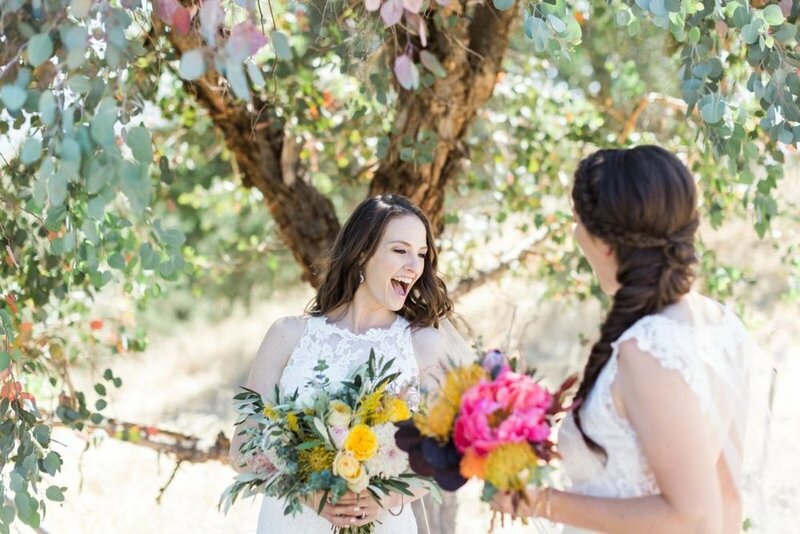 The brides wore beautiful, light flowing lace gowns and carried bouquets of local wildflowers. The sweetest details were evident at every point of the day. Everything from the food and beverages to the flowers that were locally grown and organic. Their First Look was amazing, we loved watching them as they interacted and spent time together. The ceremony space was set with an entry table with light refreshments, kippot, and parasols were available for shade. 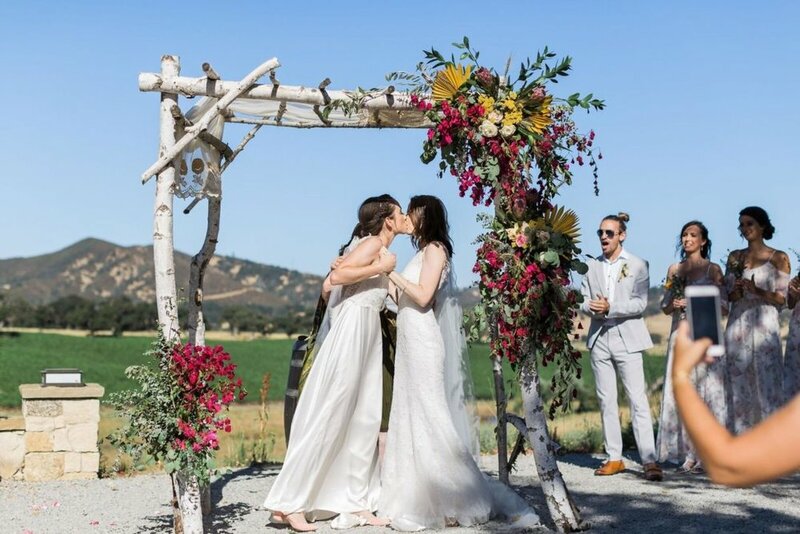 A handcrafted chuppah of natural wood, lace, and wildflowers was set against the background of the vineyard and rolling hills. The flower girls and two young men carrying a “Here Come The Brides” sign, led the way for the couple’s entrance. Each of the brides walked down the aisle with their parents to the Beatles version of “All You Need is Love”. A simple ceremony with family and friends reading the Seven Blessings, the brides exchanging rings and vows, was sealed with a kiss and both brides breaking a glass. They concluded the wedding ceremony with the traditional Ketubah signing. 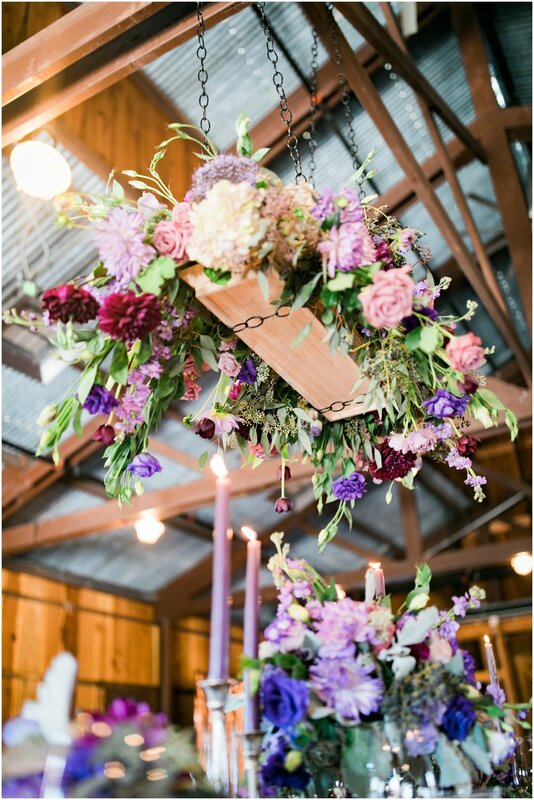 The reception barn was set with rustic wooden tables, wildflowers in an assortment of vases and mix and match vintage plates. 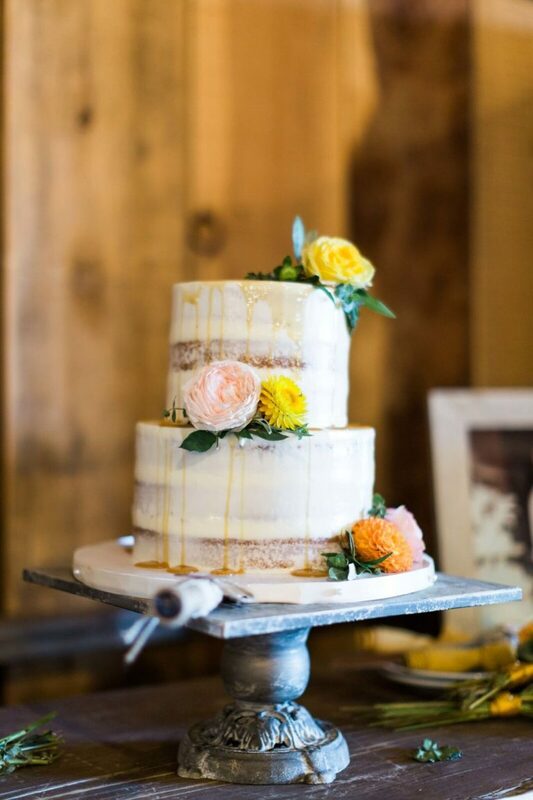 A delicious dinner of fresh, local ingredients was paired with multiple bars, craft beers, a coffee bar and a delicious naked wedding cake. Guests enjoyed the evening with a fun photo booth that had props the girls collected in Los Angeles. Lounge areas were set up for anyone who needed to rest after the non-stop partying. This truly was the wedding these girls dreamed of. Thank you to all of the vendors who made this day possible! 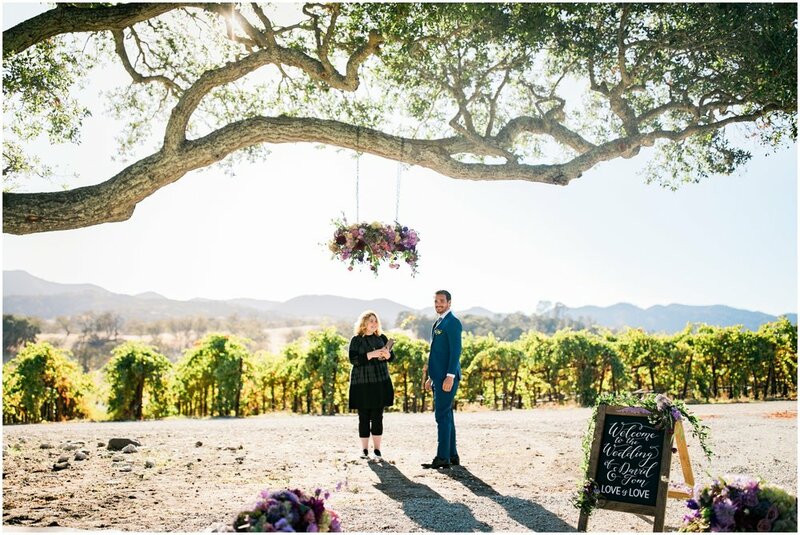 When a Wine Maker and the Vice President of Sales and Operations for an amazing catering company plan a wedding, you can be sure that it will be a unique and memorable experience. Central Coast House of Design loved working with this amazing couple to bring this wedding design to life. New Year’s Eve could not have been more perfect for this vintage inspired wedding. 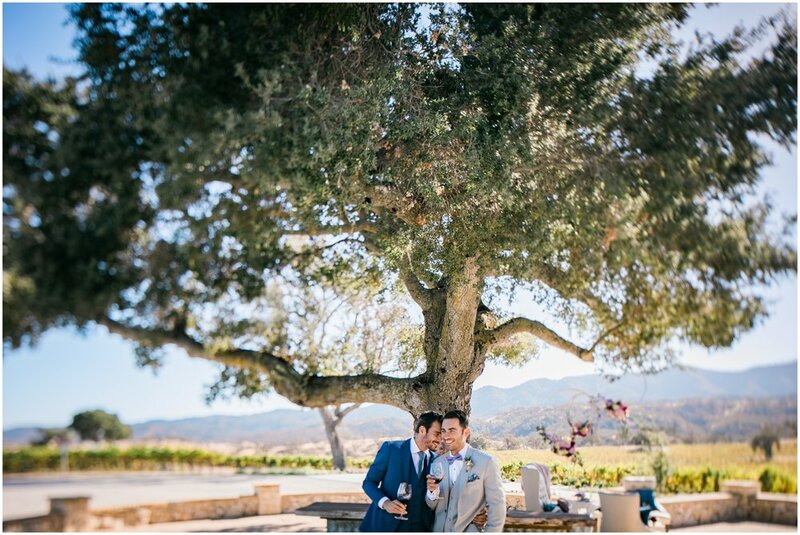 Hosted at the magnificent Vintage Ranch in the heart of California’s wine country, the endless rows of grape vines and a 300 year old oak tree set a beautiful backdrop for an intimate wedding ceremony. Gayle chose a retro Hollywood inspired gown with silver sequins and wrapped herself in a vintage fur stole. She carried a full, loose, cascading bouquet of eucalyptus, fern brushed with gold accents, roses and hanging amaranthus. It was bright, colorful and the perfect accessory. 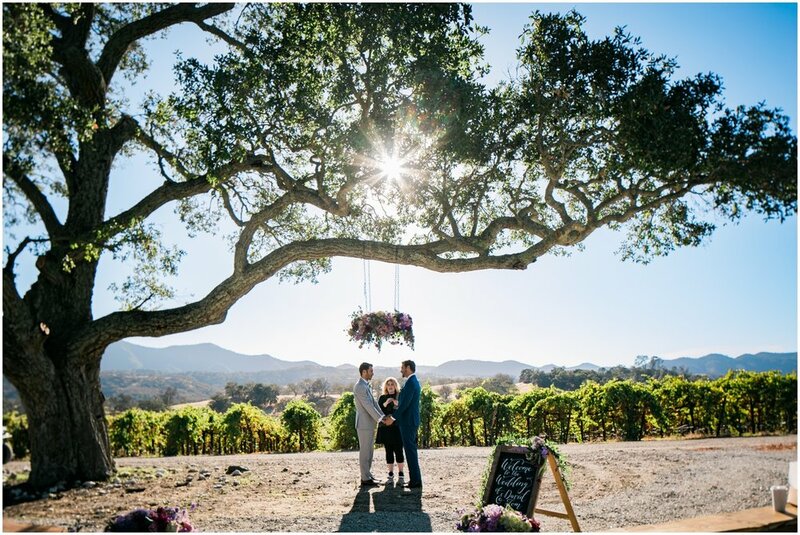 The couple exchanged rings and sealed their vows with some of Curtis’ fruitful wine; followed by time alone for some photographs around this beautiful vineyard. Guests made their way to the barn and adjacent clear tent. The vintage Hollywood glam vibe was blended with rustic charm by pairing vintage lounge furniture, Hollywood inspired chalkboard signs, and a wine and bubbly bar. A wood-burning stove, rustic barn décor, and a craft beer station completed the look. 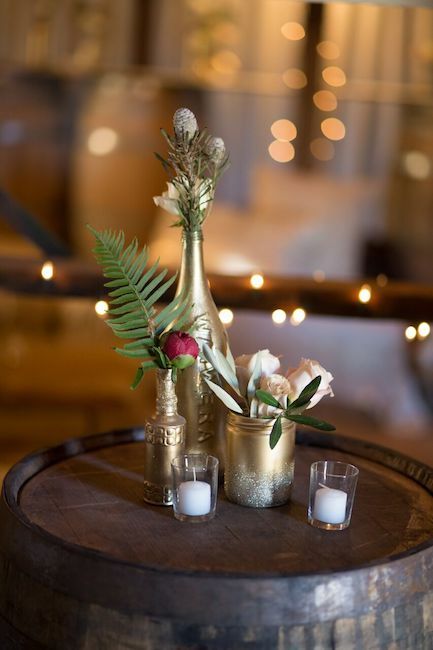 Touches of gold, twinkle lights and deep burgundy and cream flowers connected the rustic space to the clear tent used for dinner and dancing. Trumpet Vine Catering, the company Gayle works for, provided the Hors d’oeuvres. Guests were then treated to a Taco Bar from the couple’s favorite Mexican restaurant and delicious donuts from this adorable retro donut truck. The couple wrapped up the night with a traditional New Year’s Eve balloon drop, some of their favorite junk food treats and homemade wedding favors for family and friends. Thank you to all of the amazing vendors who brought this design to life.